On these pages you'll find plenty of information about Caley Hall Hotel's accommodation and the surrounding area of Norfolk which is one of the nicest places to stay in England with great reviews. Caley Hall Hotel is not part of a chain of hotels, and is often misspelt as Keighley, Kaley, Kayley, Kaylee Lodge or Kayleigh Hall Hotel. The websites creator or author is Hat Trick Media @ www.hattrickmedia.co.uk. two profiles were found for Caleyhallhotel.co.uk in social networks. Among other social networks the website is represented in Facebook and Twitter. The web server used by Caleyhallhotel.co.uk is run by Rackspace Ltd. and located in Great Britain. On this web server 29 other websites are hosted. The language of those websites is mostly english. 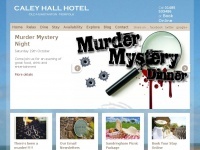 The Caleyhallhotel.co.uk websites were developed using the programming language PHP and served by a Apache server. HTML 4.01 Transitional is used as markup language on the webpages. Indexing the data of the website and following hyperlinks on it is explicitly allowed by robot information.